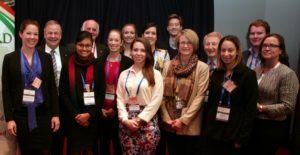 We are continuing our successful conference scholarships to encourage young people in their study, careers and volunteering in international agricultural research. This year, the Crawford Fund supported 48 young Australians from every State and Territory. See the full list of scholars, and their sponsors, below. The program for the Conference Scholars’ activities on the 29 and 31 August is now available, and you can learn more about the speakers here. If you would like to nominate and support a young person for a full scholarship that includes travel and accommodation, conference attendance, mentoring throughout the event and a day’s worth of special activities and engagement before and after the conference, you can contact Cathy Reade for further information. The cost for a full scholarship is $2000. We have had tremendous feedback from delegates on the benefits in having young people involved, so we hope many who attend the conference will help us in these endeavours. You can also donate as part of the registration process, or through our Donate Online facility on our website. Donations are tax deductible and receipts will be issued for this purpose.